When you have sawing to do, and A LOT of it, the 2000 series of vertical panel saws is the panel saw for you. 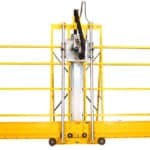 This is the "tank" of the panel saw line with beefed up features for the most demanding jobs. 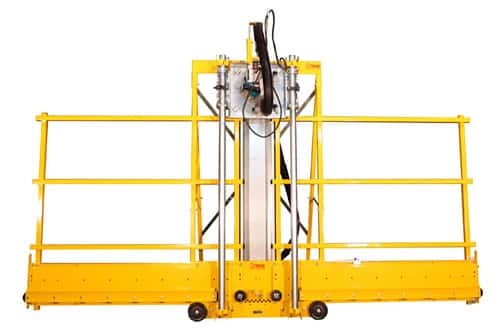 Designed for industrial operations of cutting 50 or more sheets a week, the 2000 Series Vertical Panel Saw can be called on to get the job done. The hypoid Makita saw is basically a maintenance free worm drive saw that doesn't need to have the gear box oil changed. 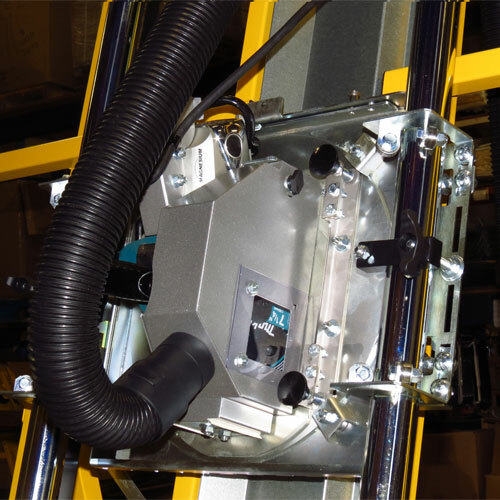 The 2000 series is the workhorse of our vertical panel saw line. It uses steel sleeves over the plastic rollers (like a bullet proof vest) to prevent damage to the rollers from dropping heavy sheets of material on them. A push button Safety Switch is used on our modified Makita 7.25″ Hypoid saw (because the handle is removed). 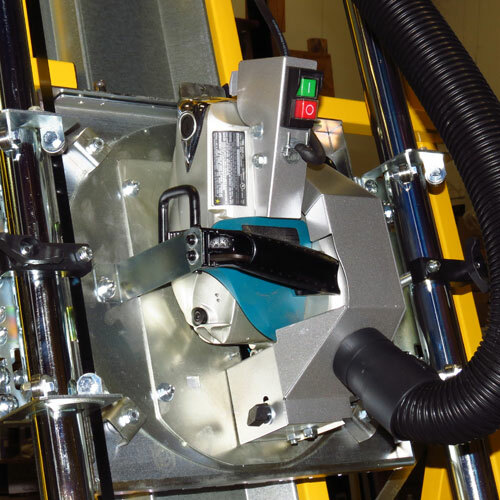 The hypoid has replaced the old technology of the worm drive skill saw being used on other panel saws. The problem with the worm drive is that is uses oil in a gear box (like your car) to cool the gears and remove metal fragments. The problem with it on a panel saw, the saw is always tilted at 75 degrees so the oil isn’t properly bathing/cooling the gears and very few people actually change the oil, let alone even know the oil needs to be changed periodically. Kind of like driving your car and never changing the oil in it. The Hypoid was designed to give the power of a worm drive but with different materials and gearing mesh cogs so there is no need for oil making it virtually maintenance free. The 2000 series has the same accessory package as the Varsity and 1000 series including a factory attached folding stand, factory attached frame wheels, spinning insert, an outstanding dust collection package, rip pointers, left and right tapes with a stop that has a strip bar attached. The design of the 2000 Series make it not only a great value, it is a unique machine in the panel saw industry. 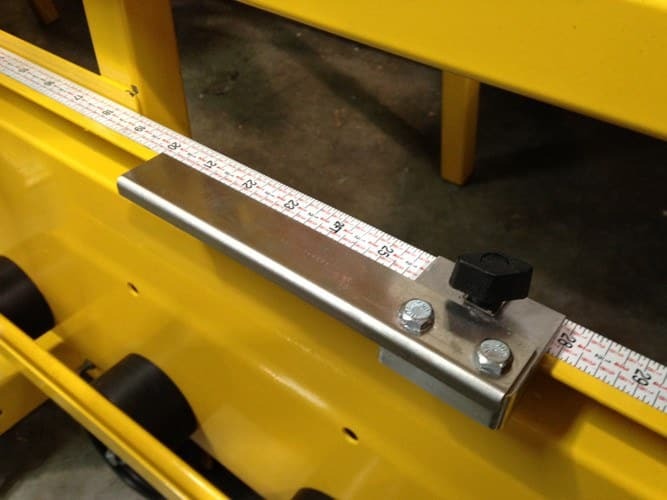 No other panel saw has a squaring system that indexes the guide tube to the frame so adjustments can be made in to be within 1/64″ of square over the length of the cut and locked into place so it does not shift. This indexing system is called the Accu-Square. Other panel saws are adjusted with a dead blow mallet, whacking the machine either left or right. 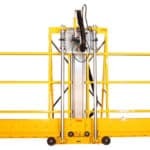 We use a similar indexing system when adjusting the material roller fence to the machine. 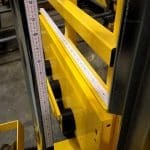 The right fence is adjusted at the factory and locked into place to ensure all the rollers are in alignment. Other machines have adjustable inner material roller wheels. 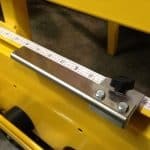 The problem with this is that you are supposed to take off their stand, lay their machine on a table and use a 10 ft. straight edge to align the rollers. (I am not making this up. It is in their Owner’s manual.) So, who owns a 10 foot straight edge to do this? Our bearing system uses sealed steel bearings for accurate and smooth movement of the carriage. Three bearings are mounted on 2 brackets on each corner of the machine. 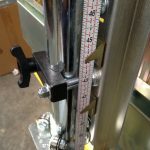 It is not as cheap as using the U-bolt and nylon rings that makes the bearing system of our competitor but does make a much better machine, and that is what we are about. Making a better machine at an exceptional value. So if the Makita 5007F saw is so good in your Classic, Varsity and 1000 Series of vertical panel saws, why did with go with the Makita Hypoid saw for the 2000 series saw? The answer is “Did you ever see a Corvette with a trailer hitch on the back?” Sure a Corvette could pull a trailer but that is not what it is designed for. The Hypoid Makita is designed for longer hours of operation on harder materials. Both saws are 15 amp. but the Hyboid is geared down like a truck and spins at a lower RPM than the “sidewinder” 5007F saw (4500 vs. 5800). Like a truck that may have the same motor as a sports car, it is geared down to plow through pressure treated lumber and other harder materials like Lexan, acrylic, solid surface, man-made marble or 1″ MDF. So, the question becomes when would you need the added power of the 2000 series of panel saws vs. the 1000 series of panel saws? We use two different criteria to help people decide. The first is, what are you cutting? If you are cutting harder materials that can bog down a saw, then you would want the 2000 series panel saw. The other is how many full sheets do you cut in a week? If you cut a bundle or more (50 sheets), then we would recommend the 2000 series panel saw. Lastly, if you just want a beefier saw similar to the Home Centers, just more accurate and easier to use, then you would want the 2000 series panel saw. There are a few nice features about the 2000 series that I want to tell you about. First, it comes in 3 different cross cutting sizes, 2052 (52″), 2064 (64″) and 2076 (76″). Our competitor only offers one size of 64″ cross cut with the antiquated worm drive saw. If you only need to cut 4′ by 8′ sheets, you would save money buying the 2052. Secondly, with the bundled accessory package, you are still under their cost of the comparable size bare bones worm drive panel saw; (Buying a better saw at a cheaper price). Since this is a heavy use panel saw, and the saw itself is heavy, we use a spring loaded counter balance. This feature will be very popular with anyone who is using it. With our machine, the saw comes up by itself and just needs a nudge to get to the top of the tubes. 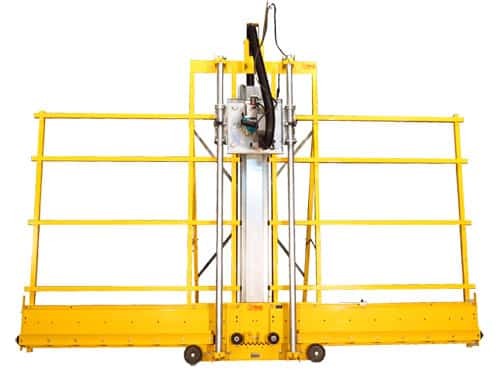 With their dead weight counter balance, you are pulling up the weight of the saw each time. This is very fatiguing if you have to make 50 or more cuts a day. The final point I don’t like about a worm drive saw in a panel saw, besides no one ever changing the oil, or even knowing the oil needs to be changed, is the angle of the worm drive saw while in use. It was never designed for the gear box oil to constantly cut at a 75-degree angle. You know you will not get the desired life out of the saw without the gear oil functioning as designed.